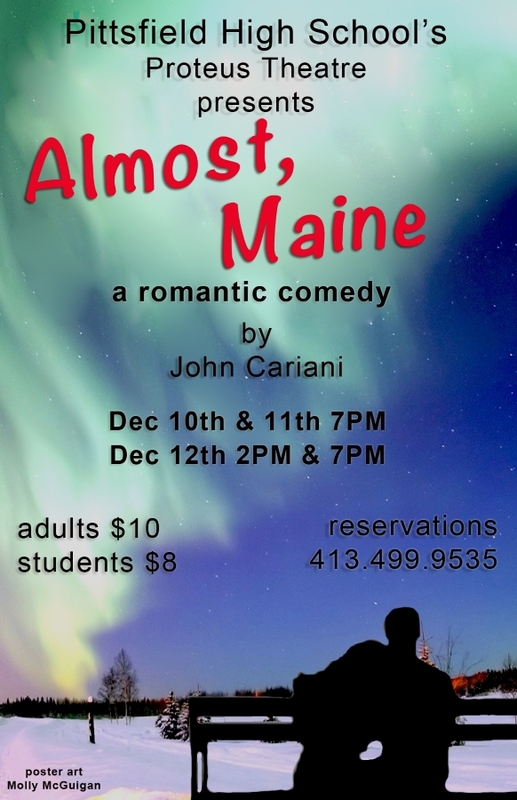 PHS Fall Play, "Almost, Maine"
Four performances of the PHS Fall Play—Almost, Maine, a romantic comedy by John Cariani—will take place on Thursday, Friday and Saturday, December 10, 11 and 12 at 7:00 pm in the PHS Auditorium; and at 2:00 pm on Saturday, December 12. On a cold, clear, moonless night in the middle of winter, all is not quite what it seems in the remote, mythical town of Almost, Maine. As the northern lights hover in the star-filled sky above, Almost’s residents find themselves falling in and out of love in unexpected and often hilarious ways. Knees are bruised. Hearts are broken. But the bruises heal, and the hearts mend—in this delightful midwinter night’s dream. "Thornton Wilder crossed with the Twilight Zone." “Romantic whimsy meets magic realism. Imagine Love Actually crossed with Our Town." Please come join us to celebrate love and humor during this time when everything around us seems to be challenging us by pulling us away from the things that matter most.